JESS O'HARE has loved Amy Rose Adams since high school. He may be a successful rancher in Copper Canyon, Texas, but a shiny new truck and a new cowboy hat doesn't change the dirt under his nails. 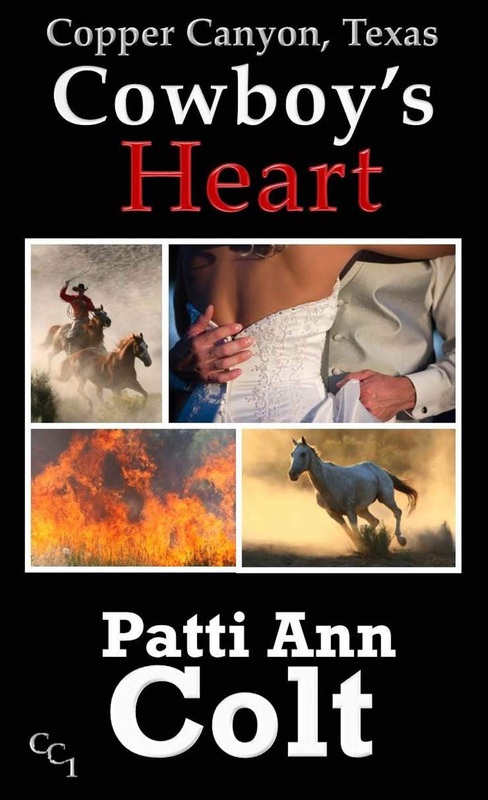 Standing in the way between him and his sweetheart are her wealthy, overbearing parents. Their dictatorial expectations lay a path for their daughter that leads away from him to the family law firm in Dallas. Law graduate AMY ROSE ADAMS has followed her parents' mandates her entire life. Only with Jess, and in Copper Canyon, can she be herself. But for three years, she's been taking the path of least resistance to hold the balance between her parents and Jess. When a fight with Jess leads to an ultimatum - his road or her father's - it echoes a similar fight with her parents. The best choice for her future is severing her relationship with her parents. But how will she make that step if she can't tell the man she fiercely loves that she's carrying their baby? Copyright 2007-2019. Patti Ann Colt. Powered by Blogger.